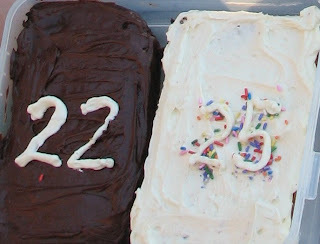 Bentley Farm Gazette: A Double Birthday: Twenty-Two....Twenty-Five! Mom planned a double birthday party for our visiting Princeton brother, Sean, and I today at the fair. Sean turns twenty-two tomorrow and I turned twenty-five today. Terry, Lisa, Greta, Zach, Sean, Jake and the rest of the entire family celebrated with a small feast of scalloped potatoes and ham on the fair lawn. Grandma and Mom even made birthday cakes to add to the merry occassion! It was a gorgeous day for rejoicing and the day was made extremely special with lots of thoughtful words and cards from family members and friends. Becca's birthday gift? 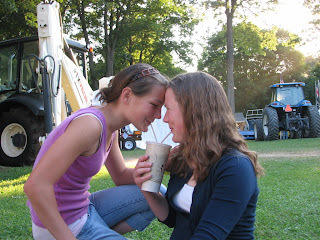 A shared chocolate milkshake from the 4-H Dairy booth!